As chocolate fever took over the nation, I was in my element. If you are in the chocolate industry, it would be fair to say that every week is chocolate week. But from 13th – 19th October chocolate makers, chocolatiers, chefs and the industry media got together to celebrate with the public and bring them an extra dose of their sweet magic. 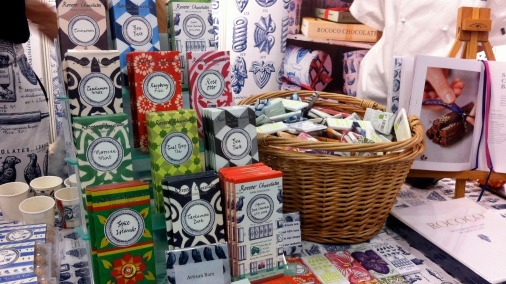 Events, chocolate inspired menus and product launches delighted chocoholics up and down the country, culminating in The Chocolate Show at London’s Olympia at the weekend. Chef Andrew Blas, in proud possession of his new chocolate. I started the week back at Hotel Café Royal (see my last post), where Valrhona had yet more new chocolate to reveal. This time it was a UK first, a collaboration with Executive Pastry Chef Andrew Blas, who has worked with Valrhona on a unique new chocolate for use in his kitchens. This kind of bespoke product is something top chefs and chocolatiers are occasionally privileged to create with Valrhona, but Andrew is the first to do so in the UK. The chocolate, Profile 66, was an excuse for a great party, which was attended by the proud experts from Valrhona who came over especially. 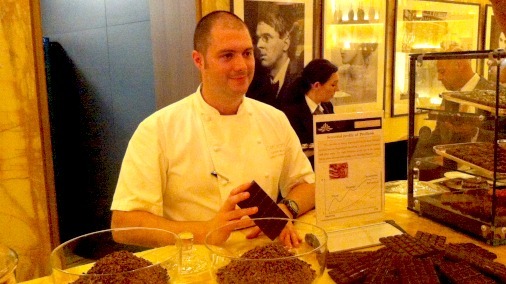 Bespoke chocolate Profile 66 – a collaboration between Hotel Cafe Royal and Valrhona. And what of Profile 66? I was lucky enough to take some home for a considered tasting. It is created by Andrew Blas as a pastry chef’s chocolate, which needs to be borne in mind on tasting it. It wasn’t intended to stand as a complex taste experience, unadorned. His desire and intention was to provide himself with something that would turn its hand to a number of his recipes, and in so doing satisfy him in a way that previous chocolates hadn’t. It needed versatility, to hold its own and also to let other flavours shine. 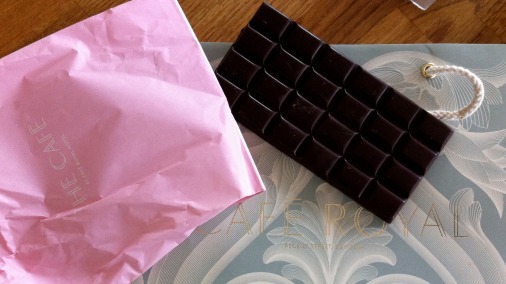 It is a gentle chocolate, without the kind of single overt flavour note that would reduce its efficacy in the kitchen. That said it is extremely easy to like. It starts with a light caramel taste, which is joined by fruit, yellow plum. The middle notes for me are honey, cocoa, and there is a finish of milky coffee. It has a good length, with the coffee lingering. And I found that after a few squares the fruit built, and there was grapefruit in the mix. Well done Andrew, something to be proud of. 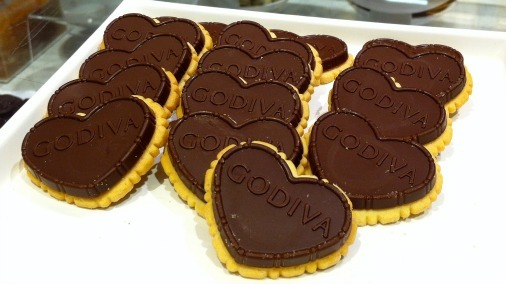 A Christmas celebration with hearts, at Godiva. All week chocolate events had an open season, so Godiva chose to launch their Christmas collection. Products of every shape and size were joined by these rather tasty biscuits. 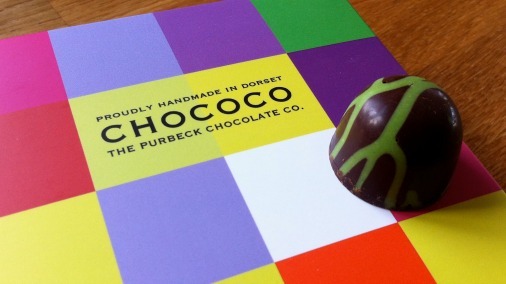 Chococo launched their new chocolate, Totally Twisted Nose, which continues their focus on using interesting ingredients local to their Purbeck home. The result of a customer competition in the shop, to create a flavour championing local ingredients, this is a chocolate incorporating watercress infused gin from Winchester Distillery, and watercress from The Watercress Company. An intriguing and beautifully made example of a chocolate made in their signature quirky style. 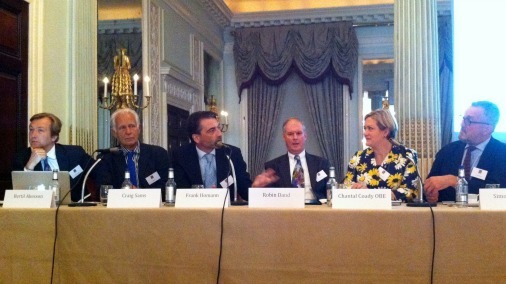 The Academy of Chocolate conference. The Academy of Chocolate conference, on thursday, was a day of reflection on the more serious side of the chocolate industry. The conference title; ‘What Price Chocolate?’ set the tone, and individual speakers and panel discussions centred around the thorny issues surrounding cocoa production and how best to aid its path to an ethical and sustainable future. Talks on child slavery in the industry, and the dramatic shortfall in price paid for cacao compared to what it costs to grow, were depressing indeed. 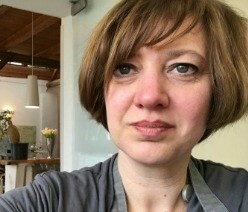 But a room-full of passionate chocolate enthusiasts debated the issues with energy and optimism. 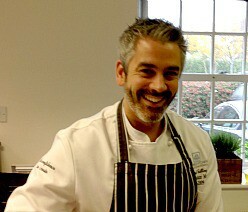 Michelin-starred chef/patron of The West House, Graham Garrett. And from friday onwards chocolate got properly fun, and delicious! 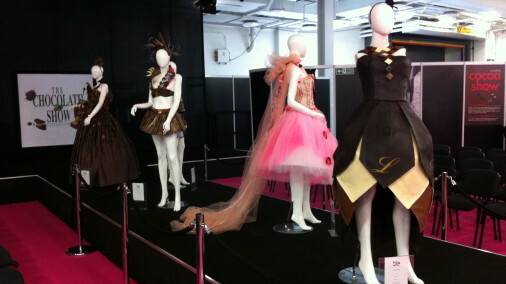 The Chocolate Show opened at Olympia with its signature chocolate fashion show (see title photo). The catwalk show was repeated daily to crowds of happy onlookers, who also had a wealth of tastings, events, talks and demos to attend. From Michelin-starred chefs, such as Graham Garrett and Atul Kochhar, to top pastry chefs, chocolatiers and Great British Bake off alumni, chocolate was whipped, stirred, mixed and cajoled into treats worthy of Willy Wonka. 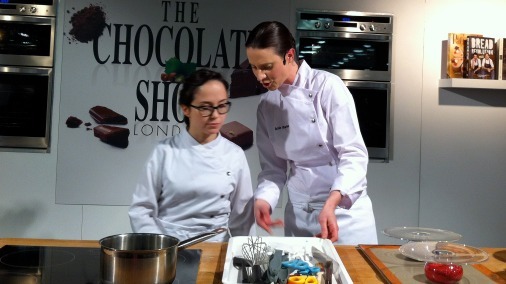 Preparing for her demo, Sarah Barber of ME London. Charlie & The Chocolate Factory did in fact set up temporary home at the show, with visits from the cast and an exhibition of props, artwork and paraphernalia from the hit West End show. Barry Johnson of Rococo with Will Torrent. 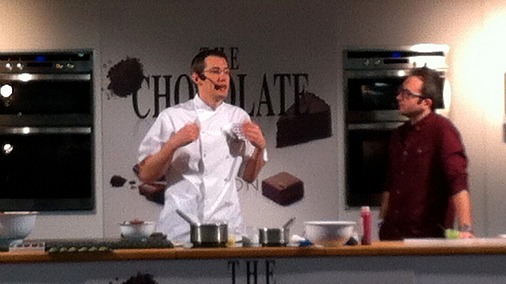 Yours truly even got involved in the events, taking to the stage with fellow food writers in a public debate on what is ‘hot’ in chocolate. Simple answer? 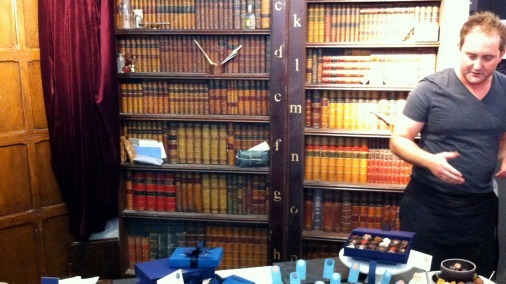 Most of the things at Olympia over the weekend! A little box of loveliness from Rococo. It was a lovely opportunity to taste many of the new things brought out at this time of year in one place. 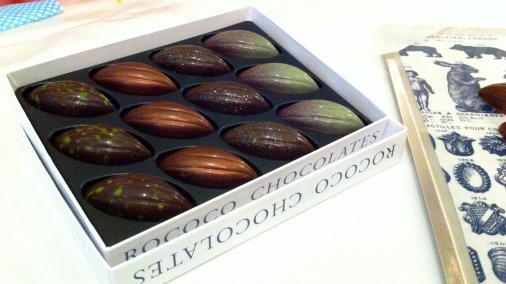 Rococo’s new Poire William caramel, for example (the pale green shaded pod in the box above). 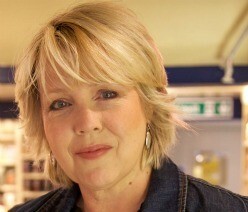 This joins the other three caramel pods, creations of Barry Johnson Principal Chocolatier, and confirmed loves of mine. The new caramel does not have the punchy freshness of the existing caramels, Kalamansi Lime, Passionfruit & Rosemary, Mandarin & Tonka, or their intensity of flavour. It is a quieter thing. It is their gentle cousin, a beautiful, fluid, buttery caramel, with the scent of pear drops, and the warmth of the Poire William booze. It has not replaced the Kalamansi Lime in my affections, but I would still eat it happily enough. New flavoured bars, from Rococo. Packed with flavour, a proper spice-fest, is the Rococo Spice Island Bar. One of a new range of bars that have been available to try in store all during chocolate week, this is a homage to the flavours and colours of Grenada. A full-flavoured dark chocolate, infused with cinnamon, nutmeg, cardamom and cloves. One I am going to be relishing as the onset of winter makes me long for warming spices. Some greatest hits from Demarquette. 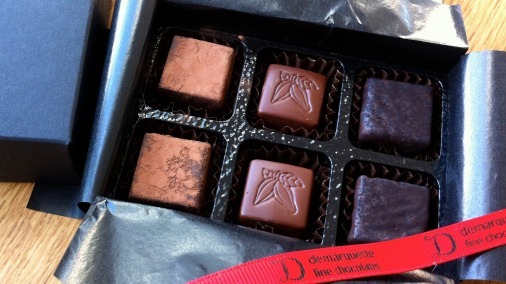 Marc Demarquette had a box with three of his most intriguing chocolates. In addition to stunning caramels and flavours, Marc is a talented purist. The Catongo, a Brazilian cocoa akin to a criollo/porcelana, was showcased in the central chocolate here with clean delivery of a flavour profile that bursts with citrus and finishes like well roasted coffee. The most interesting of all, the Grandiflorum on the right, was made from a relative of cocoa, Theobroma Grandiflorum. I haven’t tried this ‘not-chocolate’ before, and found it rather wonderful. It smells of cocoa, and is particularly fruity, full of bananas and lifted with lemon. The chocolate on the left above, African Queen, is a multi award winner, and included in the Great Taste Awards top 50 for 2014. It is an easy thing to like, creamy with delicate honey, toasted notes from hazelnut praline, and the wondrous crunch of addictive breton wafers. Yum. 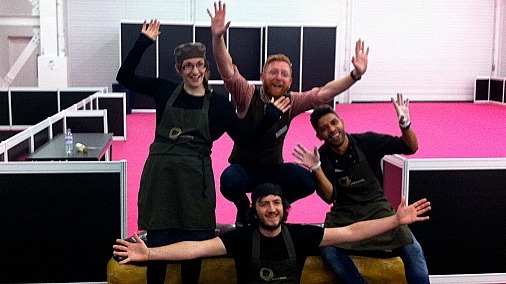 The Paul A Young crew, and a giant eclair. Paul A Young was much in evidence, his happy crew doling out samples, and chatting chocolate with wit and intelligence. 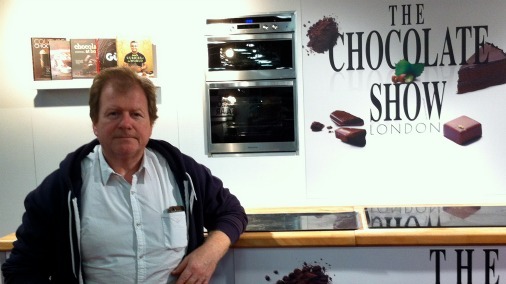 A friend’s daughter who visited the show is now quite enamoured, after Paul took the time to really engage with her and further her knowledge and love of chocolate. A one man force for the chocolate good. Still on UK talent, one to watch is Whisk & White, whose well put together range of chocolates was garnering plenty of attention. I will keep you posted. Some of the finest chocolate in the room from Friis Holm. One of the best things about The Chocolate Show is the chance to buy some harder-to-get-hold-of chocolate from overseas, and catch up with international chocolate friends. 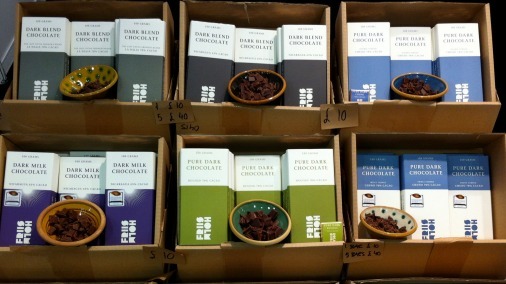 Friis Holm were there with their precisely crafted and glorious tasting bars, which I will shortly be tasting much of, as their many European medal winners go through to the world finals of The International Chocolate Awards. 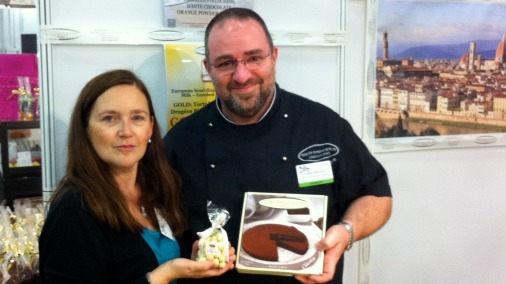 Claudio Pistocchi with some of his award winning products, and Monica Meschini. Another such is Claudio Pistocchi. I am starting to develop a serious addiction to his white chocolate pistachios with orange and salt. The definition of more-ish! 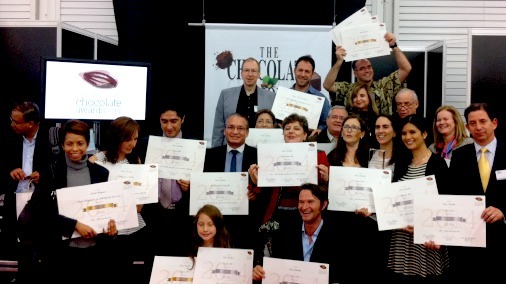 Some very happy medal winners from the Americas round of The International Chocolate Awards. The International Chocolate Awards were in full force, with the official announcements of the Americas round award winners. A stellar group of the world’s chocolate greats assembled to applaud and delight in a wealth of medals won by chocolate from the Americas and Asia-Pacifique. It was particularly uplifting to see representatives from Ecuador, Peru, Venezuela and Madagascar there to collect awards documenting the burgeoning success for products made within cocoa growing countries. 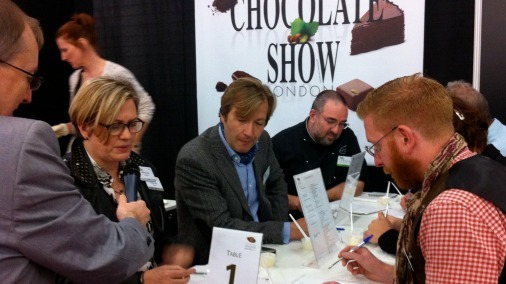 The International Chocolate Awards; ‘Judge the Judges’ or revenge of the entrants. Last, and probably least, my own personal triumph. In an exercise designed to show chocolate makers and chocolatiers the detail and determined sense of responsibility of The International Chocolate Awards judging process, some top award winners were invited to judge chocolate products made by members of the awards Grand Jury. It was not without some trepidation that I set my own two creations before such luminaries as Chantal Coady, Paul A Young, Duffy Sheardown, Claudio Pistocchi, Bertil Akesson and Mia Nyegaard. The public watched, the judges tried not to make too many lemon faces, the sense of fun (almost) prevailed. And I won! With a salted honey butterscotch 70% Congo chocolate spread, a riff on a divine sauce from the wonderful book Spoonfuls of Honey by my friend Hattie Ellis. Her sauce is far better than my spread was, so don’t worry, I won’t be switching from writing about chocolate to production any time soon. I hope you had a good Chocolate Week. And if you missed out, make sure you get next year’s dates in your diary sharpish!